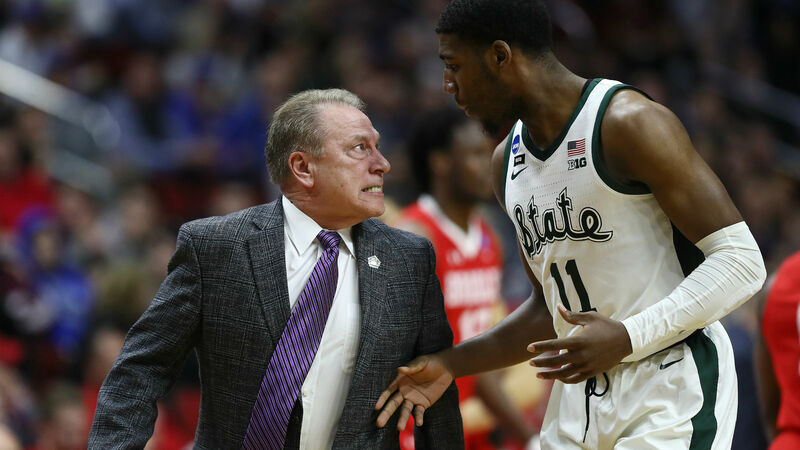 Warriors star Draymond Green came to the defense of Michigan State coach Tom Izzo after a heated interaction with forward Aaron Henry in Round 1 of the NCAA Tournament on Thursday where the coach was seen yelling at his player and had to be held back. Green, who played all four of his collegiate seasons with the Spartans, shared his "insight" in a series of tweets Friday of what he believes happened between the coach and player. He wrote: "Just an FYI. Being in those huddles for years. Cassius (Winston) and Matt (McQuaid) grabbed Iz so he could shut up and move on... after a while you’re just ready for him to draw up the play. Just giving perspective from someone who’s been apart of those huddles. ... And the reason he wouldn’t stop is because Aaron Henry kept talking. However, what the world doesn’t know is that Iz loves the kid who will challenge him back more than anything! So there’s some insight For you all!!" And the reason he wouldn’t stop is because Aaron Henry kept talking. However, what the world doesn’t know is that Iz loves the kid who will challenge him back more than anything! So there’s some insight For you all!! He ended his thoughts sharing one more tweet that encouraged both Henry and Izzo to keep doing what they've been doing. "So, Young Fella keep standing up for yourself and don’t back down. And Iz keep leading the program! We on a mission," Green added. Izzo explained after the game he was upset Henry didn't get back on defense and wasn't giving his full effort in the second half. Henry, however, didn't take the incident personally as he said (via The Detroit News) after the 76-65 win over Bradley: "It's nothing new, it's just responding to it, accepting the coaching, not having a pity party for yourself, just being a basketball player and go respond."